Initially the plan was to go to Portugal but we found out that the train trip would take 4 days, clearly above my endurance level regardless of how much I like trains. We then found the price of a plane was ridiculous. So we searched for a middle point that was interesting and Nice came up. Stilll too long by train but the plane was half the price and Elizabeth had always wanted to go to the French Riviera, so 'James, the French Riviera please' (imagine plane making sharp U-turn). We ended up in a busy hostel, high up and with brilliant views of the city. Our first day had us exploring the old town with a free walking tour in the morning and then wandering by ourselves up to Castle Hill to see the fabulous park and gaze at the awesome views down to the beach and across the city. We then decided that Monaco was only a 1 hour bus ride so let's go visit another country this afternoon. We picked a random spot in Monaco to get off the bus after a fairly high climb through the city and started to wander down. We came across the Monte Carlo Casino and it looked every bit as flash as expected with a huge concave mirror in front of it reflecting the blue sky. I was too scared to go inside imagining my life savings disappearing in two spins of a roulette wheel. We continued down the hill admiring the amazing views and huge boats in the marina. We came across a sign that seemed to epitomise the lifestyles of the rich and famous, check out the second and second last entries. On the second day it was time to go and find one of those little authentic towns they always talk about, so after several discussions with the helpful hostel staff we decided to go to Breil Sur Roya, a short train trip away. We arrived at this very sleepy tiny town and wandered down some amazing narrow cobbled streets with tall buildings on either side and went hunting for some hiking trails we were told about. We did not find them but did see a small castle type building on a hill (we later found out was Chapelle Sant-Antoine) and after asking a couple of locals started climbing towards it. It was smaller than it looked but presented some beautiful views of the countryside and the town. Back in the town everybody was in siesta mode as most of the shops were closed and we could not find anywhere for some food, starving we had to wait for Nice to eat and then went down to the beach in the dark to dip our tired feet in the warm waters of the Mediterranean. Next stop Barcelona, but this turned out to be a longer trip than expected. The train was supposed to break into two near the border of Spain and France with one half going into each respective country. But it would not come apart, in the end it went to France and we (and about a hundred others) were left lying on the platform waiting for our fate to be decided. 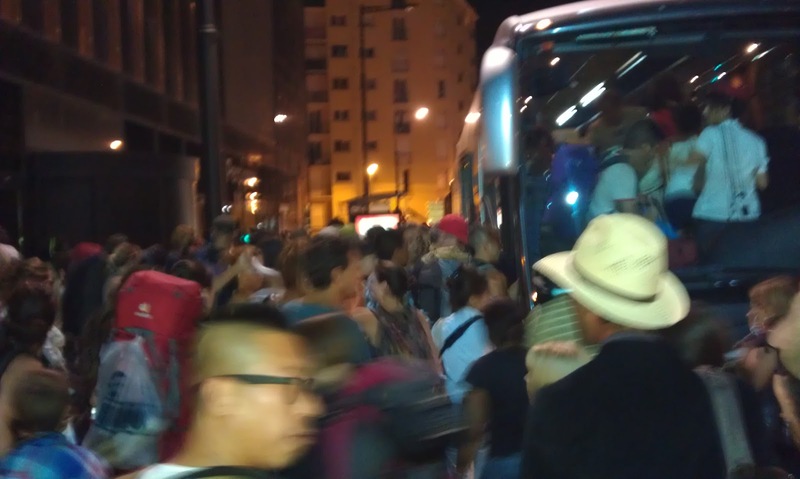 In the end they called up some buses that took about 3 hours to arrive and drove us to Barcelona about 6 hours late. We crawled into bed at about 3:30am. Barcelona was worth the wait, wow this city is beautiful and pumping with a hive of activity and a multitude of people. Elizabeth came here because of the renowned architect Antoni Gaudi (I on the other hand had never heard of him), who over a hundred years ago was doing some really weird and wonderful things to the buildings of Barcelona. On a free Gaudi walking tour we saw the outside of some of the most famous ones and then went back the next day to the one that looked the most weird to have a gander in depth. The building had a water theme and you really thought you had been transported into a Disneyland cartoon, I will post some pictures below so you can decide for yourelves but it was a feast for the senses. Unfortunately it took me about 3 hours to get Elizabeth out of this building. We also saw the La Sagrada Familia, a church by Gaudi that he never finished and they are still working on today. As like all geniuses/madmen he ended up being consumed by this building and it is so big and complicated that they are hoping to finish it in about 20 years which would be 150 years from when he started it. We did do other things like visit The Magic Fountain of Montjuic, an amazing fountain light and sound show that is put on every night. Probably the best fountain show I have ever seen and goes for around 20 minutes. It is situated at the end of a long boulevard that has smaller fountains all the way along and the MNAC Museum as a backdrop. The crowds here reminded me of Paris and it is probably like this every day. Also really cool was a previous bullfighting ring that has been converted into a mall. Bullfighting is banned in Barcelona (but not in all of Spain) and this was a great way to use the space. For a euro you can take an external elevator to the top and see 360 degree views, the picture of the boulevard with the fountain at the end was taken from here. Another top spot was Park Guell, originally an idea by Gaudi to be a residential area, it never took off, but it is huge and filled with grand Gaudi designs throughout and with high views of the city. In our 2 days here we went all day getting back late each night but still only scratched the surface. Barcelona would have to be one of my favourite cities so far. Definitely a good option not to go inside the casino. Was like 30 euros for a scotch at the bar! Cool fountain by the way! I don't think I had any photos of the inside. Was too busy losing money on the roulette wheel.